My bookshelves groan when they see me approach with a new craft book. I have so many that I hesitate to buy one in the bookstore for fear that I actually own a copy and it's just hidden behind a mountain of other books. I was given the opportunity to review Karen S. Wiesner's First Draft in 30 Days: A Novel Writer's System for Building a Complete and Cohesive Manuscript and I think I can probably unburden my bookshelves. Wiesner's book is good with a solid and doable process. And, honestly, the book reads like a friend who is telling you how to write your draft . . . a good friend, not one who will leave you in the lurch. I took the challenge of trying to write a first draft in 30 days following her method. I admit that I did OK keeping to her schedule and worksheets, but that's just because I had a week where I got off kilter (which is not Wiesner's fault, obviously! I blame that on my kids . . . ) But the process was easy to pick up again, even after a brief hiatus. 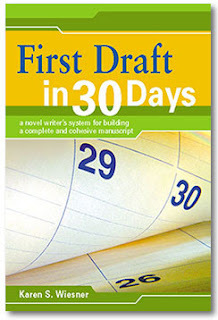 What makes First Draft in 30 Days so essential is that even when Wiesner is explaining the basics of structure, you can't help but learn something. With each element that she explains, she illustrates it with excerpts from fiction you've probably read or, if you haven't, it's been on your list to read. Also, even if you are doing some of what Wiesner suggests, such as keeping a project folder, Wiesner illustrated how to organize your system so that it works for—not against—you and your book. Wiesner's days are grouped into six "crucial" areas, so chapter three, for example, includes days 7 to 13, when she suggests you research your idea. By day 30, you are revising the formatted outline that provides your novel with its solid frame helping you to, as Wiesner writes, "lay out the full course of the story as it flows from beginning to end." She recommends using this full outline to set the stage for your second draft. This outline keeps your plot more focused and helps to avoid any pitfalls. What worked for me with Wiesner's approach is that she gives you the steps—even providing the worksheets and schedules in her appendices—and encouragement for setting writing goals. Both are incredible for getting started on a novel or even with revising a novel. Even if you aren't sure that you want to follow an outline method, such as Wiesner proposes, First Draft in 30 Days gave me some insight I needed about writing fiction. In fact, I found myself making notes on how to revise a work-in-progress while drafting another manuscript! A WOW! colleague told me she hoped Wiesner's book got my pen really moving. It did and much more. It's not surprising; Karen Wiesner is an accomplished author who has penned over 98 books in the past 15 years, which have been nominated and/or won 125 awards. She currently has 38 more under contract, spanning a variety of genres. Talk about prolific! 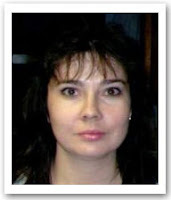 For more information about Karen and her work, visit her websites at www.KarenWiesner.com, www.FirstDraftin30Days.com, www.falconsbend.com, and www.JewelsoftheQuill.com. You can also sign up for Karen's free e-mail newsletter, Karen's Quill, and become eligible for her monthly book giveaways, by sending a blank e-mail to KarensQuill-subscribe@yahoogroups.com. In a couple weeks, I'll review Wiesner's From First Draft to Finished Novel: A Writer's Guide to Cohesive Story Building. I can't wait! Elizabeth King Humphrey is a writer and editor living in coastal North Carolina. She is now dividing her life into 30-day first draft segments to see how many books she can write for the rest of her life. Writers, you're in luck! We are giving away a copy of First Draft in 30 Days by Karen Wiesner. Just fill out the Rafflecopter form below for a chance to win! I often write slowly, even though I have a ton of ideas floating around in my mind, waiting to be written about. Hoping a system like this would help get me writing more consistently. I would love to be more productive. Have to have this book! Sounds like a valuable book! I need a ms to be finished and ready for the world by the end of summer. This would be a great resourse! Hope I win! Would love to win this book! I need a ms completed by the end of summer. Sounds like a very helpful book, so thanks for the chance to win! Yea! I'm ready to do this! Great idea for a book. If I don't win, I'll probably buy it. Thanks for the contest! I write painfully slowly because I have so many other writing commitments and not very much time. So I have no expectations about actually making it to the 30 day mark, but if she can get me moving more efficiently I'm all in! I use every excuse in the book to avoid writing. I am one really good oral story teller but putting those stories on paper is much like pushing a wet string up hill. I must own this book. I do read even if writing some days is beyond my ability. I'm a slow-writing pantster, but this book might inspire me to speed things up and be more organized! I need a little push. This book might be it. Thank You For The Giveaway. This Book Sounds Great! Thanks for submitting a comment. I started out writing by the seat of my pants. About a third into every story, I lost momentum and focus. An outline is much looser and so doesn't necessarily contain everything that will be in an actual draft of the book. It's a jumping off point. I find now that, working with a scene-by-scene outline, when I sit down to write for the day I know exactly what's going to happen in the scene I'm writing that day. I no longer face the intimidation of filling blank pages from scratch. I think that's the cause of writer's block. With the scene-by-scene outline already done, I'm working with something and the actual scenes evolve and flesh out as I write. In that way, I consider the outline the first draft of the book. It's a lot easier to write every day already knowing where you're going but new and surprising things always happen along the way so it is like an adventure every day. I can no longer imagine not starting with an outline first. karenwiesner.com; subscribe to Karen’s Quill for a chance to win my books every month! What is Regina Andrews (Dame Ametrine) up to? Find out at JewelsoftheQuill.com. Monthly book giveaways! I always have way more ideas than time to write them. That's why I use story folders (discussed in FIRST DRAFT IN 30 DAYS). Whenever I have ideas for a story, I write them down and stick them in a folder. Then I can go back to the book I'm currently working on. This happens a lot and I have a whole cupboard full of story ideas in development. When I have time to look at them, I might open a folder and find I have everything I need to write the book. Because I wrote the ideas down, I started building the story over the course of sometimes years. I never lose anything this way and the story develops over time. The really cool thing about this method is, by writing notes and keeping them in the folder, the story is always on the backburner of my mind. I have like 50 stories brewing at all times--most of them years away from being written. You wouldn't believe how much that helps when it comes to being a career author, developing future stories! I am trying to work on my first novel, but I am having trouble finding time to write because I have a family to take care of. I think this book will help me organize my time better so I can really get started. My novel is a stack of notes in a file folder that are just sitting there totally intimidating me. This book sounds like it might help me get unstuck and get going.